This is the ONLY condo building on the Seattle Waterfront so you can't get any closer to the water than this! The amazing Seattle waterfront is in your front yard and Pike place market in your backyard ~ the perfect Seattle vantage point. This is the best place from which to enjoy all that Seattle has to offer. Watch ferry boats slip by from your living room or deck with the sound and mountains in the background, walk to the Market for brunch and pick up some locally grown produce, or experience the Seattle Theater and nightlife! This modern and luxurious condo is within walking distance to the downtown Seattle shopping district, Pike Place Market, museums, music venues, Safeco and Quest Fields, and numerous coffee shops and restaurants. Bright and sunny, this 2 bedroom condo sleeps 4 comfortably. A luxurious King bed in the master, and a new queen bed in the 2nd bedroom, provide plenty of room to sleep and relax. Air-conditioning throughout. This kitchen has everything you need for quick meals or holiday feasts! Giant windows with views of the sound! We purchased our Seattle condo in April of 2007 and after an extensive remodel began staying there in June of that same year. It is truly amazing to be able to enjoy the tranquility of the waterfront while having the bustle and entertainment of the city in your backyard! It is THE quintessential Seattle location within walking distance of shopping, dining and fantastic Seattle attractions. This is the only waterfront condo in downtown Seattle. Minuets to all of the best attractions and food, please an amazing view from which to take it all in. We have 2 spots in a secure underground parking garage for guest use. We have a small collection of DVD's for guest use. Lovely condo. Beautiful view of ferries. Great gas fireplace for chilly gray Seattle winter. Enjoyed the lovely condo, view, quiet and wonderful shower. Location couldn’t have been better - short walking distances to Pike Place Market, stores, restaurants, waterfront and ferries. Lovely. 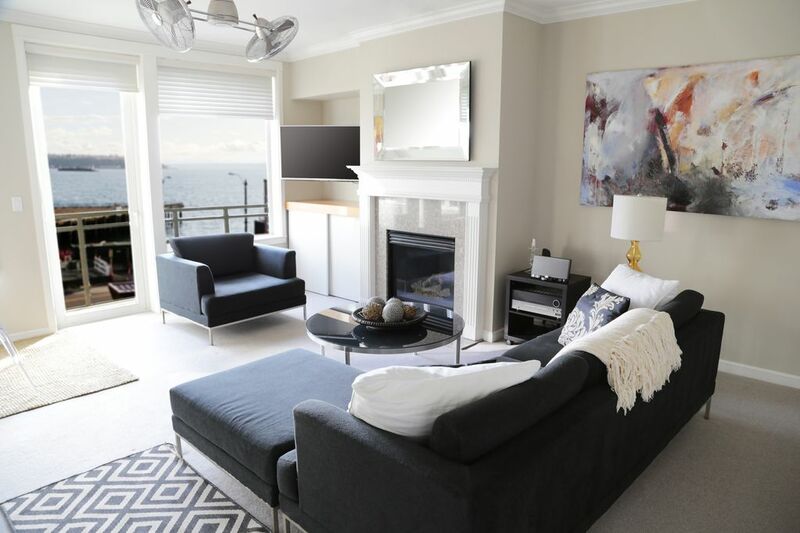 My husband and I so enjoyed our stay at this 2 bedroom condo overlooking Puget Sound. Arrival was easy once I figured out to park on Alaskan Way in front of the middle building and located the buzzer. My hubby remained in the care while I dashed in. Check in was a cinch. Parking is secured, but tight. I will rent a smaller car next time as spaces are smaller than I am used to. But, it's nice to have secured, well lit parking and easy access to the elevator. The moment you open the front door you are captivated by the view of Puget Sound. The unit is very clean, nicely appointed and was very spacious for just us two. I can't imagine why folks get hotel rooms at twice the cost when you can have a full kitchen, dining area that looks out on water, fireplace in the living room and comfortable bedrooms with terrific beds and a walk in closet in the master. It was also nice to have a washer/dryer stack in the unit as we were there a week and could pack light and freshen clothing as needed. The bathroom has a wonderful shower with rain shower head and plenty of HOT water. There is access to Pikes Public Market between the Marriott right next door and the condo building by just using the Lenora street elevator. We hit Pikes the first day for items for leisurely breakfasts watching the ferries go by, planning our day. We relaxed in front of the fire place at night with little treats from Pikes. Dining abounds in Seattle and we enjoyed the Metropolitan Grill for steaks, Salty's on Acai Beach, Six Seven at the Edgewater, and the Steelhead Diner to name a few of our favorites. We enjoyed Seattle's music scene at Dimitrious's Jazz Alley which was fabulous. The Museum of Flight is a must see! One of the finest museums in the world in my opinion. The newly renovated Space Needle is also amazing with it's glass floors. I can't wait for their dining room to re-open. Traffic can be a bear in Seattle and I say that coming from Southern California, but the homeless situation wasn't as bad as I had been warned. The Condo was a quiet and calm island to return to after an active day taking in ALL that Seattle has to offer. We were on our fourth day of a week long trip when we realized we would have to return to take in all the city has to offer. I look forward to returning to this condo in this location. Prebin was so organized and easy to work with on the booking. I am sure you too will enjoy this condo. Awesome location! Great property managers! The view from this apartment is wonderful; right out across the bay to the San Juan Islands...gorgeous! The kitchen was nice to have and had any utensil, dish or pot you might need...not that we cooked much on vacation. The living room was very comfortable and that balcony!!! The bed was comfy and the shower rocked! Location? 5 minute walk to Pike Place Market, 5 minutes to the Aquarium, 5 to the Ferris wheel, 10 to theBainbridge Island ferry. About a 25 minute walk to MOPOP, The Space Needle & The Duck Tour. Overall we had a very relaxing, enjoyable experience. Preben and Nicole were very responsive to texts and calls. I would definitely rent this place again! Excellent condo in the waterfront near Pikes market. Beautiful view of the water! Easy to access many Seattle tourist attractions. Our family of 4 loved it. Everything just worked. We arrived by car and there was the apartment guard helping with keys and finding the parking spot. Apartment is super nice - we stayed with 2 children. We make many dinners at home and kitchen worked perfectly, while children was playing in the cozy living room. You sleep so well in the beds:-) The apartment is close, so everyday we walked to the market or other places. I can only recommend this place. Pike Place Market, Seattle Aquarium, Olympic Sculpture Park, Waterfront Activities, shopping and restaurants all within a short walk. Holiday Rates apply to all major US holidays. Rates subject to change without notice.